Planning to start a family or maybe you already have several little ones running around? Maybe their room is looking a little bland or you would like to spice up their bedrooms a little so that they won’t always make a fuss when it’s bedtime. Don’t fret, because we’ve got some great ideas for you to gain some inspiration. Do you have a little princess in the making who loves pink, pink and more pink? Well, this room’s decor is perfect for her. Even though it incorporates all shades of pink, the design still makes it look timeless and peaceful. Adding elements such as white and grey furniture keeps it from being too boring, while touches of green makes it have a rather fresh vibe. Who says that blue can only be used for boys? Break out of the normal stereotype and combine the blues and greens to create this happy little haven that is appealing to both sexes. 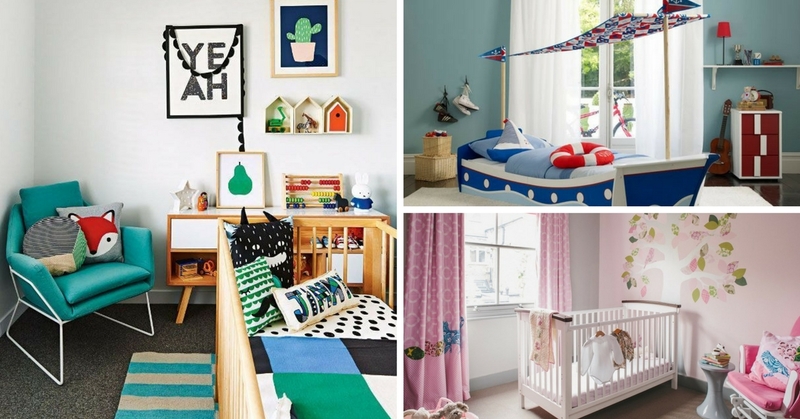 Add some cheery elements to make the room more child-friendly. It can be a big headache when you have limited rooms for your kids and they are forced to share a room. Those double decker beds can look rather dated and you want something different. Try out this super cool suspended beds at all different heights and use a warm neutral palette so that the room doesn’t look cluttered. Pastel colours are great options for your child’s bedroom, as it looks stylish and fun at the same time. It looks bright, clean and is aesthetically pleasing as well. Add some cute elements such a quirkily shaped shelf or adorable night light and you can bet your kid will just love spending time in their room. Is you child dreaming of becoming a superstar in the future? Allow them to experience the rockstar treatment now, in the very own room by putting up this awesome decor for them. It looks playful, fun and best of all, it can work for both genders and almost any age. The most suitable time to have that whimsical bedroom is when you are still a kid. If not, when else can you have the luxury of sleeping on the a bed that is shaped like a boat? Keep with the sea theme using red, blues and white but don’t make it too garish looking. Just make sure your child won’t experience seasickness when they are sleeping on the bed! This decor idea is good to use if your kid’s bedroom has a little alcove that a bed can fit nicely under. It not only makes use of that awkward space but if you install some twinkling LED lights in the alcove, your child can sleep under the stars every night.